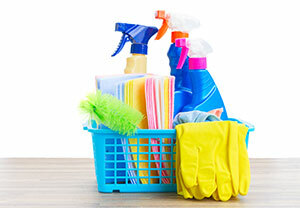 It's officially Spring which means it’s time to start thinking about deep cleaning your home. Make things easier for future you by following these 4 tips to keep your home cleaner for longer periods of times. Apply a protective sealer to your furniture once a year to keep your furniture stain free. Using a protective sealant such as Scotchgard to help ward off stains can help save you some time and money in the long-run. These products can also help against fading meaning your sofa will look new for longer. Make sure to do some research to ensure you utilize the proper protectant before applying. Granite is among the most popular countertop options, but many don’t realize the natural stone is porous. Porous countertops such as marble and granite should be regularly sealed so that they don’t absorb stains. If you don’t seal your countertops things like red wine and juice can easily stain your countertops, regardless of their color. Countertop sealers repel stains by causing the liquid to bead rather than absorb. You will want to reapply your sealant twice a year. Not sure if you need to reapply? Pour a tiny bit of water onto your countertop, if the water doesn’t bead or absorbs within 2 minutes it’s time to reseal. Nobody likes scrubbing soap scum. Give your arm a break by coating your glass shower door in windshield rain-repellent. These repellents create an invisible barrier that will prevent water and soap suds to bead and roll off without leaving a residue. You can find windshield rain-repellent at any auto supply stores. These products are meant to protect glass so only use them on glass doors. You’ll know it’s time to reapply when the water stops beading on the door. Save yourself time in the long-run by making quick work of small spills and dust. By cleaning just a little bit each day your home will need less work overall. Using a damp micro-cloth on pets can help reduce dander and dust throughout your home. Sweeping with dry sweeper cloths is also a great way to quickly pick up dust and dry wet floors. Don’t ignore the fingerprints on surfaces around your house either. Using cleaning pads to get those smudges as soon as you see them will prevent them from building up over time. Ensuring to keep closets, cabinets, and drawers shut at all times when they aren’t in use will help prevent your stored items from collecting dust.